LOWER YOUR SCORES: Our users constantly tell us that having a golf rangefinder took 2-3 strokes off their rounds. Some up to 5 Strokes! Increased Confidence and Fewer Frustrations can be yours too! TIRED OF GUESSING AT YARDAGES? : Then you need a Laser Rangefinder! Step up your game with on-demand distance information to anything on the course. Just Point & Shoot! LONG MEASUREMENT RANGE: The Breaking 80 IS500 Rangefinder has a 550 yard maximum range | You’ll always know you have the right club! 60 DAY MONEY BACK GUARANTEE – Join over 10,000 satisfied Breaking 80 customers! If you’re not happy with your Rangefinder simply return it for a full refund. No questions asked! What are you waiting for? Despite the low price, it comes with a set of features that will serve you well on the course. Let’s take a more detailed look into this budget rangefinder. The Breaking 80 IS500 comes in the classic wide body that is great for golfers who like a fuller feel on their rangefinders.The rangefinder comes with a water resistant casing, which means that it can be used in rainy weather, although it cannot handle being immersed under water. There are two buttons on the top side for operation. The top and bottom sides are fitted with textured rubber to ensure a tight grip. The IS500 also has a wider focus ring, making it easier to adjust focus with one finger. The Breaking 80 IS500 golf laser rangefinder has received favorable reviews from owners, with many praising its design and user-friendly operation. Due to its lack of some features included in higher end models, this Breaking 80 Rangefinder is suitable for amateur golfers. It is also suitable for golfers who are not ready to spend a lot of money on their golfing accessories. The overall verdict is that the IS500 is among the best rangefinders in its price range. The IS500 is not very suitable for ranging targets that are a long distance out since it tends to lose its accuracy. 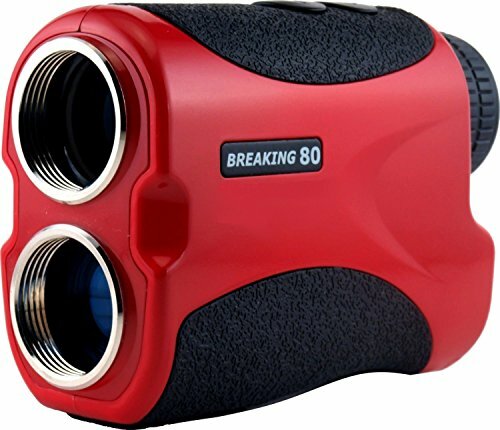 The Breaking 80 IS500 golf laser rangefinder has received favorable reviews from owners, with many praising its design and user-friendly operation. Due to its lack of some features included in higher end models, the IS500 is suitable for amateur golfers.